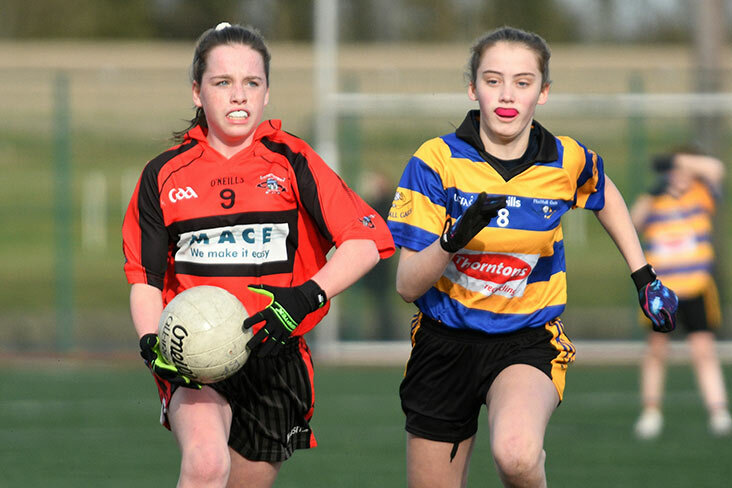 A powerful Blackhall Gaels side proved just a little too strong for the young and resilient St. Michaels girls as they claimed the Division 4 Shield in Dunganny on Sunday afternoon. The Gaels controlled the opening half and built up a commanding 3-3 to 1-1 interval lead with goals on 6, 19 and 22 minutes. St. Michaels were slow starting only opening their scoring with a pointed free from Edel Reilly after 16 minutes, Kate Mulligan followed up with their opening goal a minute later but they were unlucky not to have more scores on the board at the break as a couple of their goal bound efforts came off the uprights. Blackhall Gaels stretched their lead to to 12 points when they added 1-1 in the opening 4 minutes of the second half however the brave young St. Michaels girls battled back and controlled the next 20 minutes of play with Kate Mulligan opening the half with a point and the excellent Claire Reilly adding 2-3 without reply but time ran out on their gallant fightback and the Gaels held on sending over the insurance point with two minutes remaining. St. Michaels team & scorers: Ori-Anne McConnell; Ciara Bennett Ciara Reilly; Ciara Finnegan, Grace Keogan, Ella Armstrong; Aoife Bennett; Claire Reilly (2-3); Kellie Harten, Lauren Murphy, Anne Behan; Edel Reilly (0-1), Kate Mulligan (1-1). Subs: Ellie Jackson, Jane Mulligan, Sarah Reilly, Clodagh Kiernan, Sofie Regan, Mia Griffin, Siabh Keogan, Holly Keogan.